During our live lessons for Earth Space Science, we’ve been discussing current science events and all things space – including updates from Bennu. The reason this mission is so important is because Bennu may hold the earliest record of our solar system. If we bring a piece of it back to the Earth, scientists may be able to figure out the origins of life. 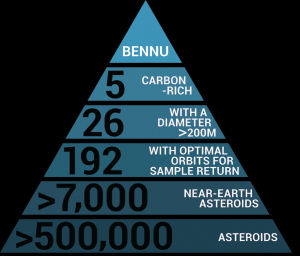 Bennu is also one of the asteroids that has a very high probability of impacting the Earth late in the 22nd century. OSIRIS-Rex will be able to determine Bennu’s physical and chemical properties. This information is very important for future scientists when developing an impact mission for approaching asteroids. There were strict guidelines in planning for this mission! This chart show the criteria NASA sought for the asteroid. On December 3, 2018, OSIRIS-REx arrived to Bennu after a two-year journey of 1.4 million miles. Already, scientists have obtained some cool information about this little four-mile long asteroid. They have found that there is a presence of molecules on the asteroid containing oxygen and hydrogen atoms bonded together known as hydroxyls. Scientists think hydroxyl groups exist globally across the asteroid in water-bearing clay minerals. What this means is that the asteroid material had an interaction with water at some point. 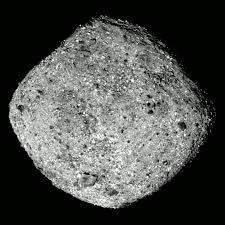 Scientist say that Bennu is too small to have ever had its own water, but the findings indicate that liquid water was present at some time on Bennu’s parent body (likely a much larger asteroid). The new surface material is a mix of very rocky, boulder-field regions and a few relatively smooth regions that lack boulders. Scientist were surprised to see that the number of boulders on the surface were much higher than they expected. OSIRIS-REx, however, will not be taking a soil sample for another nine months. OSIRIS Rex will be surveying Bennu to find the best spot to stop for a sample. Currently, the spacecraft is doing a preliminary survey of the asteroid, flying over its north and south poles as it ranges as close as 4.4 miles to better determine the mass of the asteroid. This is important to know because the mass of the object will determine the gravitational pull on the spacecraft. The spacecraft will not actually land on the asteroid, but hover over it and take a core sample. OSIRIS-REx will head back to the Earth around March 3, 2021, and will hopefully return on September 24, 2023. 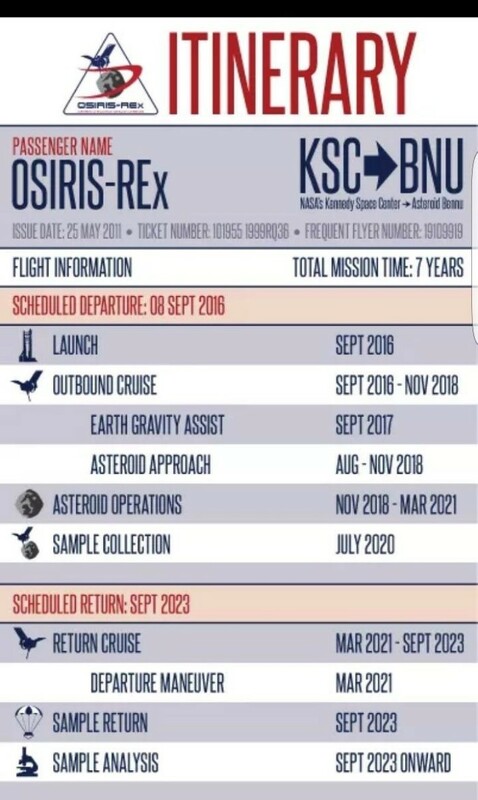 I think it’s safe to say, OSIRIS-REx will be worth the seven-year wait! I will keep you posted on this cool little mission as it progresses. Until then, if you would like to know more about the mission, you can visit https://www.nasa.gov/osiris-rex. Interested in a career in space exploration or other STEM-related fields? Consider enrolling in one of our Career & Technical Education (CTE) courses! CTE helps students prepare for the future with foundational knowledge and real-world skills. Learn more at FLVS.net/CTE. Follow FLVS for More Space Science! This weekend, I will be attending a live event for an upcoming SpaceX launch to test their Crew Dragon vehicle for future astronaut flights. FLVS Kindergarten teacher Cara Piper and I will be sharing live updates with our students and followers on social media. Join us by following @floridavirtualschool on Instagram! This entry was posted in Educator Edition, Student Edition and tagged Earth Space Science, NASA, NASA Social, OSIRIS-REx, Science, STEAM Education, STEM, Virtual Field Trips on February 27, 2019 by Linda Childs.